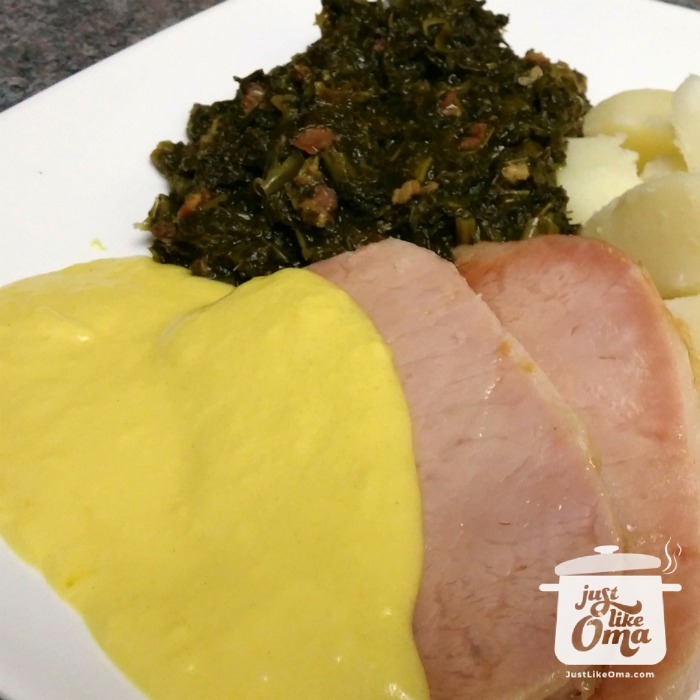 Leftover peameal bacon roast served with mustard sauce, kale, and potatoes. So good! This is Heidi's secret recipe for making an alternative to Kassler -- so easy and so delicious! 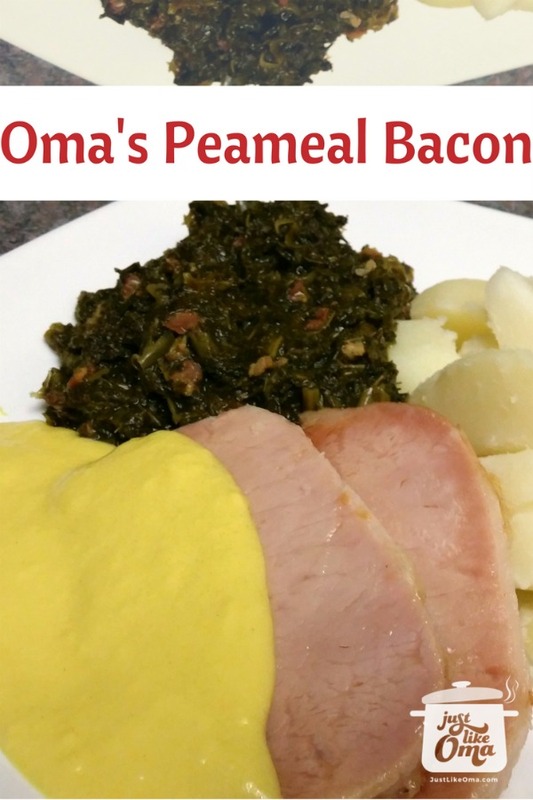 Using a Canadian peameal bacon roast produces a very similar result, at a much, much lower cost! I use my new Cuisinart multi-cooker slow cooker (crockpot) for this. Check my Kassler adventure below! Empty one can of sauerkraut into slow cooker. Place meat on top. Cover with second can of sauerkraut. Cover and cook on low about 8 hours. Carefully remove meat and scoop out sauerkraut. Keep both warm. Pour slow cooker juices into pan and bring to simmer. Mix corn starch in a little cold water. Slowly add just enough corn starch mixture to the simmering slow cooker juices until sauce is thickened. Pour sauce over sauerkraut and mix. 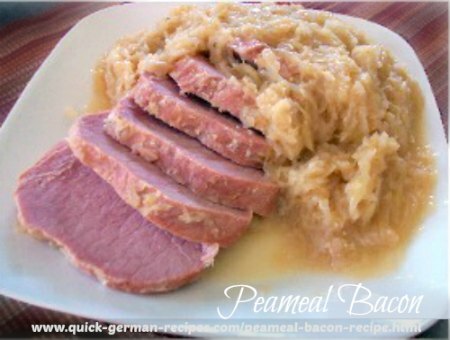 Serve slices of meat and sauerkraut with boiled or mashed potatoes. Another name for Canadian Peameal Bacon is Cured Boneless Pork Loin. If it is rolled in cornmeal, leave it on or wash it off - both ways taste good. Cut up some peeled apples and put them under meat in the slow cooker for extra flavor. Adding some browned onion slices to slow cooker is also a nice addition. Adjust quantities to slow cooker size and number of servings needed. Leftovers can be reheated in microwave. I carried my Mutti's tradition over into my own family. That meant, we rarely ever had Kasseler! Rarely, because it's expensive. I kept it as a real treat, and then, only when it was on sale. Imagine my surprise when I dropped in on my friend, Heidi, and she invited me to join them for supper. They were having Kasseler! It was the middle of the week! Slow Cooker for German Foods? Here's the sauerkraut served together with the peameal bacon. Above, I've used the leftovers, reheated in the microwave (with a bit of butter on top to keep the slices moist) and served along side some mustard sauce and kale. 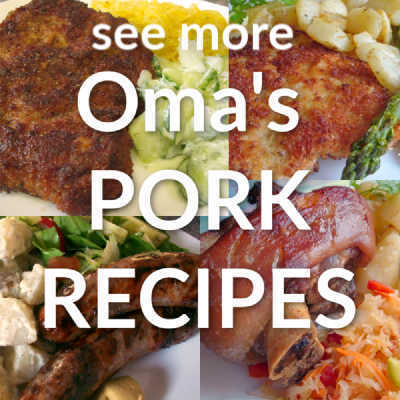 Even though this is to be a site of QUICK German recipes, using the slow cooker really does fit. The preparation is quick. In the morning, once it's all in the pot, just turn it on and walk away. Go to work, go shopping, or just go and do what you want. Come back at night, dinner's ready with very little else to do. My kind of cooking! "Intelligent people are always ready to learn. Their ears are open for knowledge."